Yeah, but: More to come when I know anything useful. Counter Opinion: Today I spent a brief amount of time with the New Ricoh GR, and I'm as determined as ever to buy one. True, my hands-on time was less than twenty minutes, but when I had a chance to try the 'Coolpix A' I set it back down after just a fraction of that, impressed at the concept but uninspired by its execution. Button-and-dial EV comp? No thanks, I prefer to spend my time taking pictures. The GR that I used, like all of the ones that people have been writing about so far, was a late preproduction unit without final firmware. Unlike some bloggers, I'm not about to attempt a definitive or comparative analysis of image quality and performance, especially as its DNG raw files are still waiting for proper profiles from Adobe. 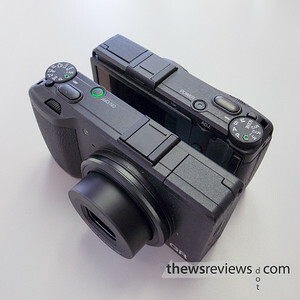 However, as a newly-minited Ricoh GR Digital owner nothing I saw made me unhappy. The GR is slightly longer than the GR Digital IV, but that's an improvement, not a demerit. There's more finger room around the front grip, and the camera feels better than the Girdiv in my average-sized hands. It remains a small camera, and isn't bigger-enough to make a practical difference for carry; while the camera is also a little thicker than the previous model, it can still be tucked in a back pocket when it's not in use. Finding a good case might be a challenge, but it's one I'm happy to accept. The lens has only one extending section versus the GRD-IV's two, and seems less point-and-shooty when the camera is powered on. But rather than looking more 'serious', a la Fuji X100, I think the look is more reminiscent of an unthreatening film camera. I could absolutely see bringing the GR as my only digital camera for my annual summer-starting trip to New York City, should I be lucky enough to own one by then. The biggest operational difference between the GRD-IV and the New GR is the macro mode. While the GR isn't bad – nothing at all like the Canon G1x – because the two cameras look and feel the same I kept trying to get too close for the new kid. As a result I can see an Eye-Fi equipped Girdiv becoming my camera of choice for easy product review photos, such as these ones, while the GR does the real work. In terms of speed I couldn't feel much difference between the IV and the New GR / GRD-V models, with AF being pretty snappy on both. The GR seems like a bit of an improvement in pretty much all areas, and I have remarkably few complaints about the old one, so that works just fine for me. I'm looking forward to having this camera to call my own. Counter Opinions are quick "sales counter" product reviews. As always, viewer discretion is advised.